What must Nokia do to get back into the smart phone war? I am going to answer this query using Nokia CEO, Stephen Elop’s leaked memo (Ref: http://ree.ms/elop_memo ) as the base for information where it is now accepted that Nokia has lost the smartphone war. The situation is so drastic that Elop compares situation to a “burning platform”. 1. The Platform (“eco-sysytem”) War: the two major participants are Apple iOS and Google Android with Microsoft Winmo7 & RIM/BB fighting for distant third place. Microsoft in all probability will emerge 3rd by sheer force of cash. If Nokia chooses to join the Platform War, then as Elop rightly identified, the scope of the battle is much wider as it involves Hardware form factor, Operating System, Developer community, Applications and App Stores, multiple features involving location, search and social. This is a war which Nokia could have won if it entered in 2007. Today as we approach 11th Feb 2011, it is simply too late. Nokia has the lowest cash resources compared to AAPL/GOOG/MSFT and is minimum 2 generations behind the development cycle. Nokia is better off being a “kingmaker”, where it can choose to support either Android or Windows7Mobile and make either of the 2 very competitive against market leader Apple. Nokia can then focus on its traditional strength, Devices. In the Device War, Nokia has the distribution and experience to tackle competition once it chooses to go with Android or Windows 7. Android is clearly ahead of Windows 7, and Nokia-Android is a better combination if Nokia wants to remain an independent Device manufacturer. If Nokia chooses Windows 7, then it is better off for Nokia shareholders if Microsoft buys out Nokia. Microsoft has the cash and needs the manufacturing expertise of Nokia in many markets. Ad Magnet has become the largest Indian Media property online reaching 18.5 Million Unique Visitors in India (basis comScore April 2010 data release). 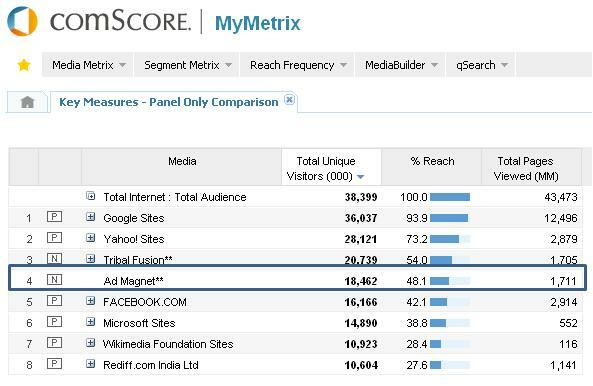 This means Ad Magnet’s publisher network reaches almost HALF of all Indian web users. If we include global properties, Ad Magnet is the 4th largest behind only Google, Yahoo & Tribal Fusion, all US based. Google was founded 13 years ago, Yahoo started even earlier, almost 15 years ago and Tribal Fusion is 9 years old. Ad Magnet in comparison was started just 2 YEARS ago! A phenomenal achievement. Ad Magnet is funded by Sequoia Capital which has also been an early investor in Google, Yahoo, YouTube, Apple and Cisco amongst many path breaking Silicon Valley companies. 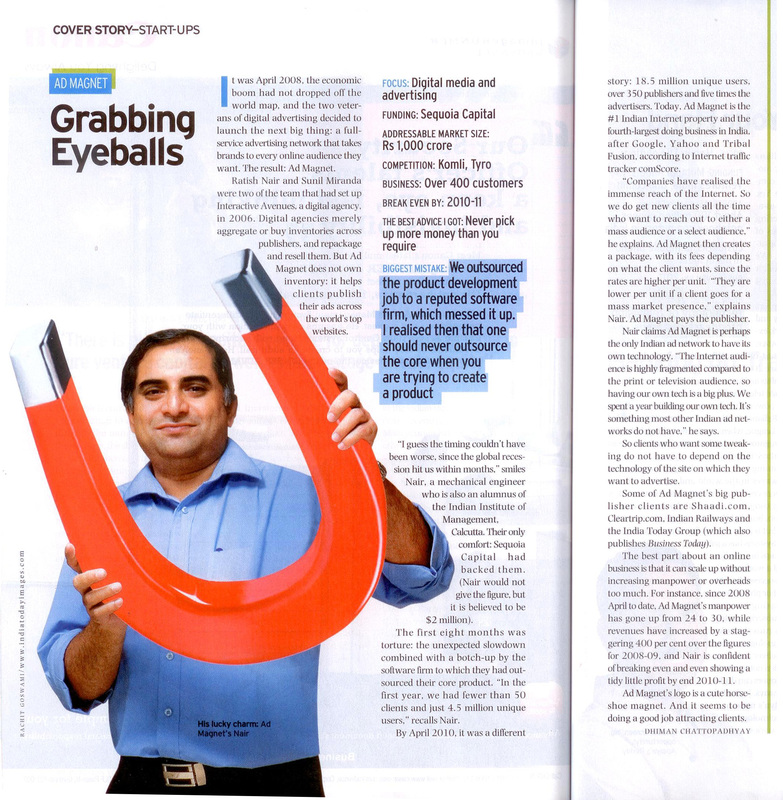 Ad Magnet has also now been featured amongst India’s hottest startups in Business Today magazine (India’s premier business magazine published by the India Today Group). Ad Magnet is featured as one of the hottest startups according to Business Today. Disclosure: I work in Ad Magnet. Life re-created. Blue colonies (top) indicate a successfully transplanted genome, with self-replicating bacteria revealed in an electron micrograph. ROCKVILLE, MD and San Diego, CA (May 20, 2010)— Researchers at the J. Craig Venter Institute (JCVI), a not-for-profit genomic research organization, published results today describing the successful construction of the first self-replicating, synthetic bacterial cell. The team synthesized the 1.08 million base pair chromosome of a modified Mycoplasma mycoides genome. The synthetic cell is called Mycoplasma mycoides JCVI-syn1.0 and is the proof of principle that genomes can be designed in the computer, chemically made in the laboratory and transplanted into a recipient cell to produce a new self-replicating cell controlled only by the synthetic genome. This research will be published by Daniel Gibson et al in the May 20th edition of Science Express and will appear in an upcoming print issue of Science. To complete this final stage in the nearly 15 year process to construct and boot up a synthetic cell, JCVI scientists began with the accurate, digitized genome of the bacterium, M. mycoides. The team designed 1,078 specific cassettes of DNA that were 1,080 base pairs long. These cassettes were designed so that the ends of each DNA cassette overlapped each of its neighbors by 80bp. The cassettes were made according to JCVI’s specifications by the DNA synthesis company, Blue Heron Biotechnology. The JCVI team employed a three stage process using their previously described yeast assembly system to build the genome using the 1,078 cassettes. The first stage involved taking 10 cassettes of DNA at a time to build 110, 10,000 bp segments. In the second stage, these 10,000 bp segments are taken 10 at a time to produce eleven, 100,000 bp segments. In the final step, all 11, 100 kb segments were assembled into the complete synthetic genome in yeast cells and grown as a yeast artificial chromosome. The complete synthetic M. mycoides genome was isolated from the yeast cell and transplanted into Mycoplasma capricolum recipient cells that have had the genes for its restriction enzyme removed. The synthetic genome DNA was transcribed into messenger RNA, which in turn was translated into new proteins. The M. capricolum genome was either destroyed by M. mycoides restriction enzymes or was lost during cell replication. After two days viable M. mycoides cells, which contained only synthetic DNA, were clearly visible on petri dishes containing bacterial growth medium. The initial synthesis of the synthetic genome did not result in any viable cells so the JCVI team developed an error correction method to test that each cassette they constructed was biologically functional. They did this by using a combination of 100 kb natural and synthetic segments of DNA to produce semi-synthetic genomes. This approach allowed for the testing of each synthetic segment in combination with 10 natural segments for their capacity to be transplanted and form new cells. Ten out of 11 synthetic fragments resulted in viable cells; therefore the team narrowed the issue down to a single 100 kb cassette. DNA sequencing revealed that a single base pair deletion in an essential gene was responsible for the unsuccessful transplants. Once this one base pair error was corrected, the first viable synthetic cell was produced. This publication represents the construction of the largest synthetic molecule of a defined structure; the genome is almost double the size of the previous Mycoplasma genitalium synthesis. With this successful proof of principle, the group will now work on creating a minimal genome, which has been a goal since 1995. They will do this by whittling away at the synthetic genome and repeating transplantation experiments until no more genes can be disrupted and the genome is as small as possible. This minimal cell will be a platform for analyzing the function of every essential gene in a cell. As in the team’s 2008 publication in which they described the successful synthesis of the M. genitalium genome, they designed and inserted into the genome what they called watermarks. These are specifically designed segments of DNA that use the “alphabet” of genes and proteins that enable the researcher to spell out words and phrases. The watermarks are an essential means to prove that the genome is synthetic and not native, and to identify the laboratory of origin. Encoded in the watermarks is a new DNA code for writing words, sentences and numbers. In addition to the new code there is a web address to send emails to if you can successfully decode the new code, the names of 46 authors and other key contributors and three quotations: “TO LIVE, TO ERR, TO FALL, TO TRIUMPH, TO RECREATE LIFE OUT OF LIFE.” – JAMES JOYCE; “SEE THINGS NOT AS THEY ARE, BUT AS THEY MIGHT BE.”-A quote from the book, “American Prometheus”; “WHAT I CANNOT BUILD, I CANNOT UNDERSTAND.” – RICHARD FEYNMAN. The JCVI scientists envision that the knowledge gained by constructing this first self-replicating synthetic cell, coupled with decreasing costs for DNA synthesis, will give rise to wider use of this powerful technology. This will undoubtedly lead to the development of many important applications and products including biofuels, vaccines, pharmaceuticals, clean water and food products. The group continues to drive and support ethical discussion and review to ensure a positive outcome for society. Funding for this research came from Synthetic Genomics Inc., a company co-founded by Drs. Venter and Smith. The research published today was made possible by previous breakthroughs at JCVI. In 2007 the team published results from the transplantation of the native M. mycoides genome into the M. capricolum cell which resulted in the M. capricolum cell being transformed into M. mycoides. This work established the notion that DNA is the software of life and that DNA dictates the cell phenotype. In 2008 the same team reported on the construction of the first synthetic bacterial genome by assembling DNA fragments made from the four chemicals of life—ACGT. The final assembly of DNA fragments into the whole genome was performed in yeast by making use of the yeast genetic systems. However, when the team attempted to transplant the synthetic bacterial genome out of yeast and into a recipient bacterial cell, viable transplants could not be recovered. Ethical Considerations: Since the beginning of the quest to understand and build a synthetic genome, Dr. Venter and his team have been concerned with the societal issues surrounding the work. In 1995 while the team was doing the research on the minimal genome, the work underwent significant ethical review by a panel of experts at the University of Pennsylvania (Cho et al, Science December 1999:Vol. 286. no. 5447, pp. 2087 – 2090). The bioethical group’s independent deliberations, published at the same time as the scientific minimal genome research, resulted in a unanimous decision that there were no strong ethical reasons why the work should not continue as long as the scientists involved continued to engage public discussion. Dr. Venter and the team at JCVI continue to work with bioethicists, outside policy groups, legislative members and staff, and the public to encourage discussion and understanding about the societal implications of their work and the field of synthetic genomics generally. As such, the JCVI’s policy team, along with the Center for Strategic & International Studies (CSIS), and the Massachusetts Institute of Technology (MIT), were funded by a grant from the Alfred P. Sloan Foundation for a 20-month study that explored the risks and benefits of this emerging technology, as well as possible safeguards to prevent abuse, including bioterrorism. After several workshops and public sessions the group published a report in October 2007 outlining options for the field and its researchers. Most recently in December of 2008, JCVI received funding from the Alfred P. Sloan Foundation to examine ethical and societal concerns that are associated with the developing science of synthetic genomics. The ongoing research is intended to inform the scientific community as well as educate our policymakers and journalists so that they may engage in informed discussions on the topic. A fascinating counter-point on the Global Warming phenomenon is given by Thomas Gale Moore. Read his amazing article “Why Global Warming Would Be Good For You”.